PocketGamer.biz highlights a recent addition to Apple's iOS developer guidelines revealing that the company is now specifically targeting third-party apps intended to serve as repositories of information on other App Store apps, whether it be in the form of curated app discovery, promotional listings, price drops, or other similar app directory features. 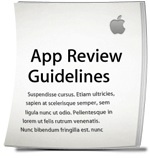 The new guideline was added in a quiet update to Apple's developer documentation alongside the iPhone 5 media event last month. TechCrunch has more on the situation, with industry experts suggesting that such apps will likely remain in the App Store but that Apple will no longer approve updates for them, allowing them to fade away over time. App discovery has long been a challenge for Apple given the sheer number of titles in the App Store, and Apple's acquisition of Chomp earlier this year was seen as a sign of renewed efforts at improving that experience. Apple has implemented some aspects of the Chomp interface in the App Store under iOS 6, but discovery of new apps remains difficult for many users. Does that mean no more updates to app shopper? You know what would aid app discovery? Free trials. Not to mention give users a great metric: apps that have been "tried" but not bought are likely crap. The current system of "lite" apps just crowds the store. Services like Tapjoy (http://www.tapjoy.com/) are sure to be hit hard by this. Players then earn in-game currency for installing and launching those apps on their devices, which boosts App Store rankings. It's pathetic. Simple: If your the CEO of BMW, how would you feel about your automobiles sharing data with Audi about their drivers favorite experiences from driving a BMW? Probably the worst analogy ever. WTF? In what way does helping consumers find and purchase apps hurt Apple? They're going to get their percentage either way! If iOS 6 would've made the app store experience better instead of worse, I wouldn't mind this news. The new app store is so slow that I cannot casually browse it as I did before. What does this mean for AppShopper? I'm anxiously awaiting the iPhone 5 update and hope this doesn't stop that from happening. if it means less obtrusive in app ads for other apps im all for this.